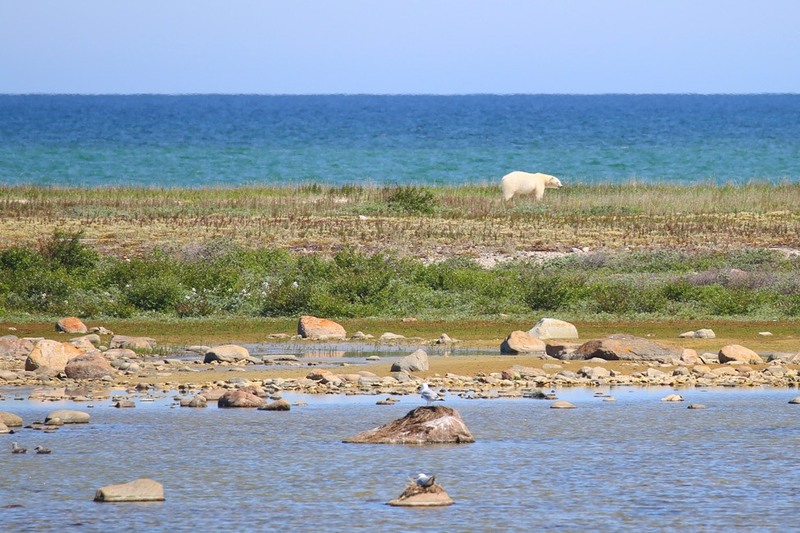 After my aquatic adventures were over, we still had a few last land-based excursions to enjoy outside the quirky town of Churchill, Manitoba. Ever the girl scout, I was prepared for both temperature fluctuations and camouflage needs at all times. The afternoon after my morning snorkeling excursion, my Frontiers North tour itinerary called for an afternoon of dog carting. I have to admit, I was skeptical — and even discussed with my tour guide Doug the possibility of sitting the afternoon out. For one, I was cold and exhausted and curling up with a hot chocolate and editing my video footage from the morning sounded like a dream. For two, I’d never really considered the ethics of dog sledding or carting before and as a passionate animal adorer I didn’t want to support anything that wasn’t up above board. However, in just a few short days I’d come to greatly respect Doug’s judgement, and so when he assured me that I’d be impressed with the care and respect shown for the dogs and that he felt it was something I should experience, I agreed. After all, the history of dog sledding is deeply intertwined with the history of this region. To understand it is to understand a piece of this culture. Enter Dave of Wapusk Adventures. Dave is the founder of the Hudson Bay Quest, a dog sledding competition that stretches from Churchill, Manitoba to Arviat, Nunavut, as well as an accomplished musher himself. After an enthusiastic welcome from the dogs outside, we piled into Dave’s cabin to learn more about his life in Churchill, his Metis background, and his passion for his dogs. The house we were in was humble, but Dave proudly showed us the premium protein dog food he had shipped in from Quebec. He told us stories of effectively throwing races he stood a good chance of winning because he had to prioritize his dog’s health and comfort, and of long nights on the trail spent hunkered down in a sleeping bag on the snow, surrounded by his pack of dogs. He told us that the proudest he felt was when he won awards for best kept dogs, rather than fastest time. While the dogs conditions might have been different from what I was used to — I certainly felt uneasy with the idea that they spend most of their time chained outside — Dave’s love for his dogs felt heartwarming and familiar. Perhaps not all dogs need to cuddle up on queen size beds with their owners, ride in the front seat and wear Halloween costumes to be happy (I can hear my cocker spaniel Tucker protesting from his poolside perch in Los Angles right now). In the winter, dog sledding tours are of course a popular draw. In the summer, wheeled carts are used to run the mile-long “Ididamile,” a play on the famous Iditarod race. As Dave and his crew started pulling together a team of dogs for the first few runs, the dogs seemed to lose their minds with excitement. This is indeed a breed that loves to work, run, and please their people. The route was indeed exhilarating, and I loved watching the dogs move in unison as they seamlessly responded to the musher commands. Should you go dogsledding? It’s a decision every traveler has to make for themselves, and I encourage you to do research on the topic and vet (pun intended) your intended operator closely. I know that I’m glad I did. The next day was somehow our last in Churchill — oh, how it had snuck up on us! But we had one last land-based adventure before setting off on our late night flight back to Winnipeg: a day out on Frontiers North’s own Tundra Buggy. These extreme all terrain vehicles allow for navigating tricky winter terrain and safe yet up-close wildlife viewing. These buggies are so big, you need to use a special platform to get on and off them! In the summer, the buggies follow an existing set of tundra trails built by the Canadian and American Armed Forces in the 1950s and 1960s. In the fall, some guests even stay overnight in the mobile Tundra Buddy Lodge within Wapusk National Park, a prime polar viewing region. Frontiers North proudly proclaims to hold the only business license to house guests inside Wapusk, one of Manitoba’s two national parks. They also hold the most permits to operate on the trail network within Churchill Wildlife Management Area. Basically, these guy are kind of a big deal around here. Our driver Jim was quite the character, and it wasn’t long before he was pointing out animals across the tundra. For brief sightings, like a fox scampering away with a bird in its jaws, we’d simply observe and photograph from the open windows of our seats. For more bucket list sightings like curious polar bears, we’d park entirely and could walk out on the back viewing deck for an even more wide-open look. In terms of quantity, we were spoiled for polar bears on this day, spotting over ten in total. 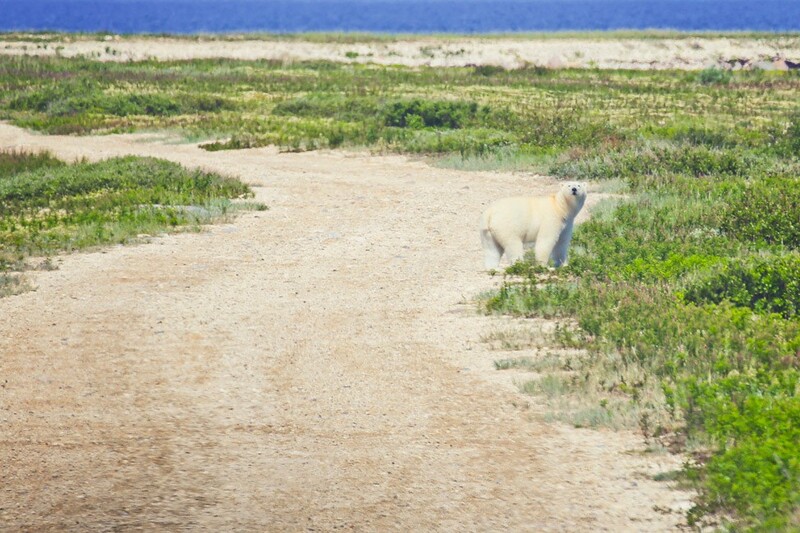 That said, we never really got the up-close quality I’d been aching for — I greedily wanted one of the polar bears to approach the vehicle, as these curious creatures are known to do in the colder months. However, that kind of interaction in the summer is quite rare, and we were lucky to see as many as we did. Doug told us he firmly believed the good energy of the group increased wildlife sightings, and that we were knocking it out of the park for that time of year. Someday, we may look back and marvel even more greatly at these sightings. It’s no secret that the polar bears have been having a rough few decades. 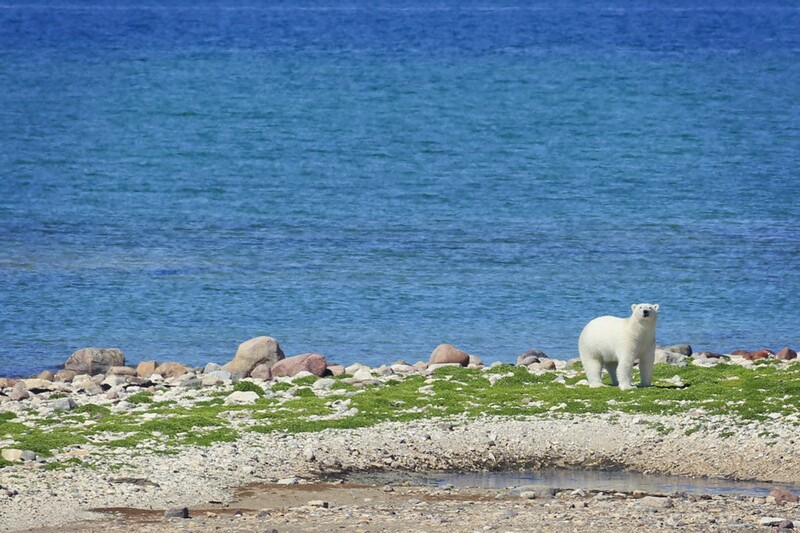 The playing field of legal hunting from aboriginal groups is made uneven by modern inventions like snow mobiles and guns, development threatens the bear’s natural habitats and most importantly, climate change has shortened the bear’s hunting season drastically. With Hudson Bay melting earlier and each summer and freezing later each fall, bears have less and less time out on the ice to build up their fat reserves for the rest of the year. So it’s no surprise that their numbers have dropped by 22% in the past thirty years, and trend that shows no sign of stopping if we don’t curb or reverse global warming. I think we all went home with a new appreciation for how important it is to do just that. But in this moment, we simply adored watching the bears go about their lives, sussing out what we could about their personalities and their moods just from sitting and observing them for a while. I knew for this trip, my mediocre Canon 70-300mm lens wasn’t going to cut it. So for the first time ever, I coughed up $170 to rent a Canon EF 100-400mm from Borrow Lenses. Unfortunately, I don’t know if I’d do it again. While the company’s customer service was great, I was disappointed with the quality of the lens. Another photographer on my trip had the same one (which she owned) and the image quality between my banged-up rental and her much-revered lens was huge. Looks like it’s time to start saving for my next big glass investment! We spent an entire day in the buggy, stopping for a hearty and healthy lunch while gazing peacefully out the windows. It was a truly magical end to a truly magnificent trip. I could not have enjoyed my time with Frontiers North more than I did. While I don’t think of myself as a “take a tour” kind of girl, every time I do, I find myself impressed by how well organized it is, by how much I learn, and by how greatly I enjoy the company of my guide and fellow travelers. This was no exception. I have no doubt I’ll find myself back in Churchill. Whether to get up close and personal with the polar bears in the fall, to witness the northern lights and indulge in a pop-up restaurant of my dreams in the winter, or to come back and try my hand at photographing the belugas again in the summer. There’s just something magnetic about this beautiful place. 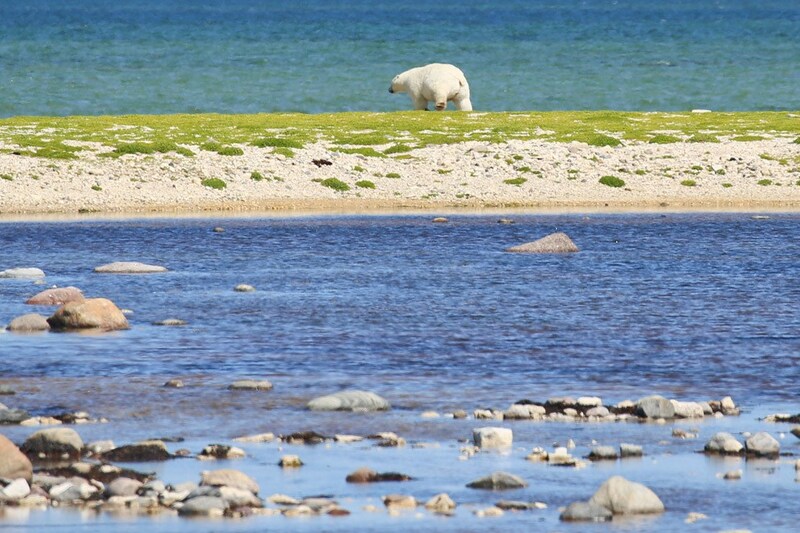 Where to stay: Accommodation is simple and functional in Churchill. I stayed at the Tundra Inn which was lovely. Their sister property Tundra House is Churchill’s first hostel, starting at $35 a night and operating yea- round expect for October and November when it is used as housing for seasonal workers. Where to eat: We didn’t have to go far — our best meals of the trip were at Tundra Inn’s beloved onsite restaurant! Gypsy’s Bakery was another favorite. How to get around: The town is tiny and easily walkable — just keep an eye out for bears. Here is a list of local taxi rates, if you aren’t on a tour and need to get around. Bonus tip: Plan ahead early — and I’m talking a year or more — for October and November’s busy bear season. I heard travelers who show up unaware by train during this period are given a floor to sleep on in the local church, as the few hotels and guesthouses have booked up long in advance. I also found mesage boards filled with people who booked last minute and had to change hotels every night in order to make their trips happen! For this reason and many, many others, a tour is often the logistically easiest way to go. This post was written by me and brought to you by Travel Manitoba. Many thanks for Frontiers North for hosting me.